Look through your website, press releases, and older marketing material and I’ll bet you find lots of content that still has value. Perhaps with a quick proofreading and updating, you can breathe new life into what seemed like long-since-useful material. 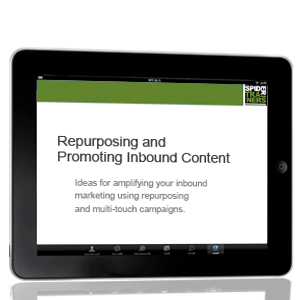 In this slide deck we discuss ideas for amplifying your inbound marketing through repurposing existing content and using that as the basis for multi-touch campaigns.